As a thought leader and mentor in the coaching space, I often receive inquiries from people who want to explore coaching as a profession or a skillset, and who seek advice from someone who successfully navigated that path already. In a 20-minute conversation, I can load them up with ideas and resources about coaching. Central to my advice is a reminder that coaching – well, GOOD coaching, at any rate – is not “just” something you learn how to do, like writing a contract or delivering a speech. You must also examine who you are and how you show up in the world, and deeply understand the mindset(s) that you bring into your coaching conversations. Recently our local coaching chapter hosted the author and researcher, Marilee Adams Ph.D., author of Change Your Questions, Change Your Life, a book about the mindset of Inquiry. Are you a Judger or a Learner? Do the questions you ask (self and others) seek blame or possibility? The book made her a rock star of sorts in the coaching world. I told Marilee that her book is one of the five top titles I recommend to people who seek to understand what coaching’s all about. She asked, “What are the others?” I snapped this picture to share with her, and now I share with you. 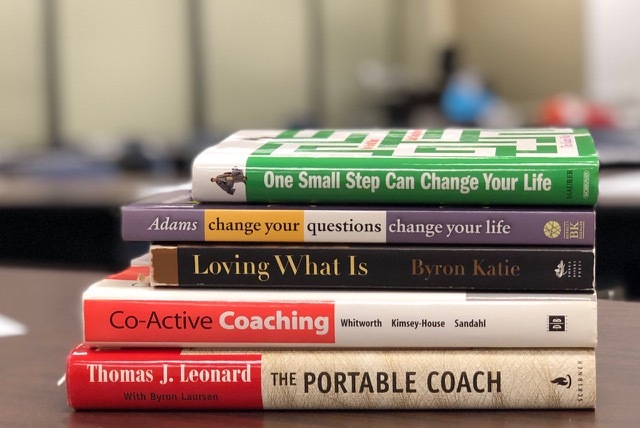 The Portable Coach is a classic that was part of my inspiration years ago when I had the opportunity to work with its author, Thomas Leonard, one of the founders of the coaching profession. Co-Active Coaching is still one of the best “how to” manuals on the topic, chock full of tools and questions and coaching frameworks that appeal both to newbie and veteran practitioners. Loving What Is, by Byron Katie, can be a tough read. It challenges the worldview of suffering and introduces you to The Work, a process to reframe every judgment you make about others. One Small Step Can Change Your Life: The Kaizen Way plays into the power of tiny changes that gradually build to powerful processes. And when you need support, give me a call. I meet for dark coffee!